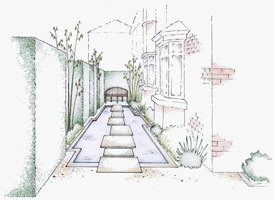 This urban Dublin garden design is largely centred around the use of bold, focal point water features. The pool seen in the small front courtyard below draws on its reflective qualities to bring light to the restricted space. A large contemporary water feature was used in the design of the courtyard, with the stepping stone flags appearing to float on the water’s surface. 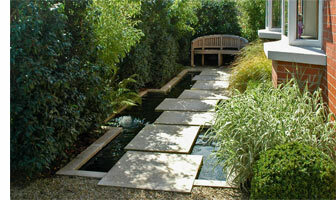 The formal water feature is used to maximum effect in this small courtyard space while the stepping stone flags appear to float on the water’s surface. The strong architectural lines of the design draw the eye towards the focal point bench. 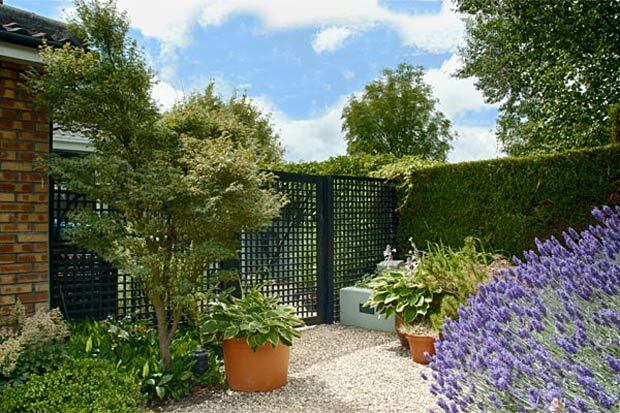 With this garden design the staggered line of the retaining wall adds visual interest to the finished garden. Viewed from the dining room, the cascading pool, coupled with the surrounding architectural planting, provides a strong visual link with the garden. The combination of rendered retaining walls, granite cobbles and cut stone paving adds richness to the final design. 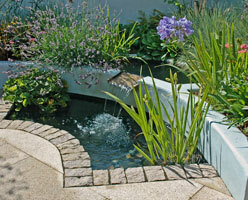 Plan Eden has an extensive portfolio of water garden design plans and previous projects. Here again, the water feature is central to the layout of this space and its split-level cascade design brings the low toned and tranquil sound of moving water to the rear courtyard. 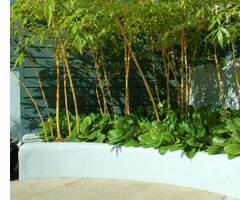 Careful use of plant form and texture with a restricted colour palette were key to the planning of this garden.